Your ability to build a bigger, leaner and stronger body is directly correlated with the number of workouts you can do, and how much intensity you muster each time you hit the gym. If a workout leaves you so stiff and sore that you can’t move for five days, results will come slowly at best. But if you can drastically reduce soreness and restore strength levels, you will gain muscle faster because you can train more often with a higher intensity. Research is mounting to support the use of tart cherry juice as a highly effective recovery aid. It appears that supplementing your pre- and post-workout training with it can provide a powerful assistance to recovery by reducing soreness and restoring strength more quickly. In addition, tart cherry juice has shown to have a positive effect on boosting your natural melatonin levels so you can sleep better: a key to faster recovery and growth. 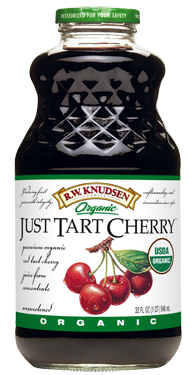 How does tart cherry juice help you recover faster with less overall soreness? The reason is likely due to the fact that tart cherries contain flavonoids and anthocyanins that induce strong antioxidant and anti-inflammatory effects. What it showed: 10 well-trained athletes consumed tart cherry juice 7 days before and until 2 days after a bout of leg extensions for 10 sets of 10 reps. Subjects restored strength faster and measures of protein carbonyls (a marker of oxidative stress in aging and disease) were reduced. What it showed: 20 subjects consumed tart cherry juice 5 days before and until 2 days after a marathon run. Three markers of inflammation (interleukin-6, C-reactive protein, and uric acid) were reduced, and strength was restored more quickly. What it showed: 14 male college students drank tart cherry juice twice a day for 8 days. They performed a workout on the fourth day. Strength loss and pain were reduced. Surprisingly, it appears that you don’t need much tart cherry juice to get a favorable effect. The studies vary greatly with regard to dosage: some were as low as a few ounces per day while other protocols were as high as 24 ounces per day. It’s also likely that the extract in pill form could produce the results you’re after if the carbs scare you. 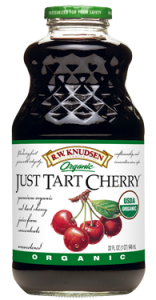 For the last two years I’ve been using tart cherry juice with my athletes and myself. The results have been impressive, so I thought I’d share my protocol with you. Keep in mind, this protocol isn’t necessarily what I’d do for pure fat loss, but when it comes to building muscle, strength, and performance, this combo works awesome. 15-30 minutes before training: 4 ounces of tart cherry juice mixed with 4 ounces of water and 1 scoop of Organic Warrior Whey. It’s important to note that part of the effectiveness of this protocol comes from this whey. It’s simply the best protein powder I’ve ever used. Since it’s not heated or acidified in the manufacturing process it contains all the natural immune boosters that help reduce soreness, restore strength, and build muscle. And it tastes incredible. You’ll soon learn how chemically bitter other protein powders are when you taste it for the first time. Make no mistake about it: when you mix grass-fed whey with organic tart cherry juice you have a powerful combination during your workouts to combat muscle soreness and supercharge recovery and growth. Do you personally use this in conjunction with a Warrior Diet approach (1 main solid feed a day) or have you modified your dietary approach to more actual meals per day recently? It would be great to get an updated post on your nutrition approach especially in light of supporting the more frequent ring workouts you seem to be doing and any new findings. CW: I still eat one primary meal per day, but this covers my workout nutrition. very interesting. I will try it. CW: Yes, it will work great for any type of training. Thanks for the info but I am a little confused. You recommend the cherry juice and whey immediately after training, but in previous posts, Ori recommened waiting 30 mins after training before taking the whey? CW: His recommendations were for pure fat loss. This is more for growth and recovery without regard to fat loss. How does this compare with the dark chocolate recommendation? Can the 2 protocols be used together? CW: The chocolate works well for workout performance, but tart cherry is probably better to reduce soreness if that’s something that hinders your training frequency. CW: Right now, it’s tough to say exactly what mechanisms are at work to provide the effects from tart cherry juice. But rest assure, research is mounting to support its use and I’m sure more science will follow. followup q: im sure youve experimented on yourself & clients with varying amounts of the juice – so, any additional benefit to more of the juice pre & post? or is it a case of diminishing returns? CW: I haven’t seen any additional benefits but I haven’t tried much more. I suspect that adding more juice to pre- or post-workout could make you tired due to the effect on melatonin. However, that might be a benefit post-workout if you have time for a nap. hey Chad this is just what I need! I started training again after a 4 month lay off due to a bad shoulder injury. I maninly workout with rings and after my firts workout My body felt it was on fire for 2 days and thus my next workout was not what i wished it to be as i still felt very sore and stiff. I’m sure this is gonna help me. Thanks! We have urged women to get relief from postpartum soreness through cherry juice intake. We have been taught of uricase enzymatic property breaking down uric acid buildup in inflamed joints and damaged soft tissue. This works like tomato juice on lactic acid filled muscles and relieves “DOMS”. CW: Thanks for the input, Ozie! CW: I’m not sure if regular cherry will work as well. I always use the tart cherry version since that’s what studies researched. The organic whey Instantized is out of stock. Would the warrior whey non organic work too? CW: It’s back in stock now. But plain Warrior Whey is the next best option. hey, however the content of your post isn´t new to me it is good to be reminded to it cause i did never really stick with it…so thanks for this! do you think concentrated fruit juice does the job, too? CW: Concentrated fruit juice has too much sugar, unfortunately. Great article. Quick question though. Does taking Cherry Tart affect one’s insulin levels pre and post workout which could then affect muscle growth? CW: The time around your workout is the best time to boost insulin so amino acids will get shuttled into your muscles. Beta-Alanine supplement works great for managing soreness. So is Cherry Tart somehow superior to Beta-Alanine? CW: BA is good, but tart cherry also has the added benefit of improving your sleep patterns. Out of curiosity, what’s the day-in-the-life like for Chad Waterbury on the Waterbury Diet? CW: Thanks! You’ll learn that very soon.